There are places on earth where great souls have lived, not those that have run corporations, made huge sums of money or were world famous, but those that have lived an exemplary inner life. They leave footprints on the earth like the scent of perfume lingering on a woman’s dress. If you sit quietly and tune into them, they have a profound effect. 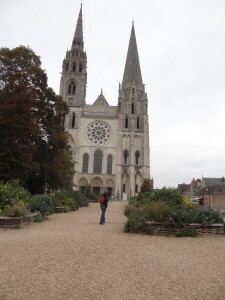 Chartres Cathedral can be seen from maybe 10 miles away. It is currently being repaired so we weren’t able to take a tour, but inspiring none the less. Again, I wish I had the vocabulary to describe this peeling, crumbling masterpiece of architecture. If you ever read Pillars of the Earth by Ken Follett; you know that stone masons, glass men and other builders walked from city to city in the tenth to thirteenth centuries building these enormous churches. They didn’t go home every night with chocolate ice cream in the frig and a movie to watch. Life was violence and survival. In this cool, musty quiet environment ceilings crisscross into the heavens. All one can think of is hope and a promise of a better life. A group of singers in a far distant corner sounded as if they really were angels singing as the their voices echoed off the stone walls. 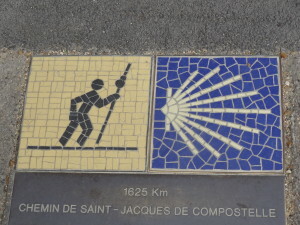 This was also one of the beginning places for the Pilgrmage to Santiago de Compostela during the Middle Ages. An incredible vibration in this place. 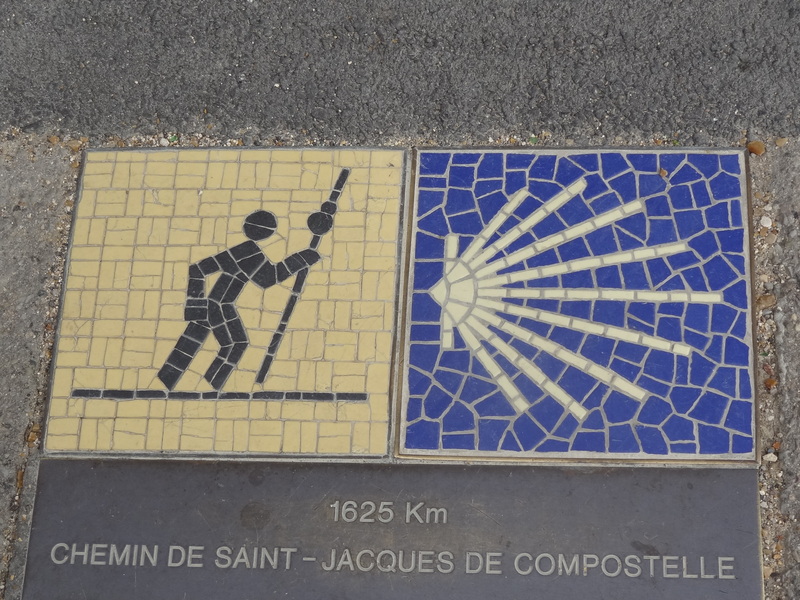 I asked a young man at the travel information office in Chartres where we might eat our last dinner in France. David and I crossed streets and plazas and a river and finally found the place he recommended. My first course was served in a large white plate that looked like a nun’s hat from the Sound of Music. In the center was a small “cup of soup” size bowl which contained tenderest of — lobster, leeks, and French sorrel in a butter sauce with herbs I could never decipher. Main course was a piece of salmon lightly cooked and still moist with a hint of ginger, but the skin side (which I often remove) was crispy and tasty. The vegetables were sauteed in butter and tarragon but oh so subtly. Mashed potatoes were not potatoes at all but maybe rutabaga, turnips, and what we call salad radishes. That was the dinner of a lifetime. An overnight flight, as if in a dream, we were in India. India is not an easy country to travel in. Compared to France, I think of it as a “teenage” culture. Noisy, growing in spurts, sometimes stinky, lots of issues and constant movement. I love how the people of India, of course not all, have so little compared to our lifestyles, yet know how to be happy and content. They are curious and open and ready to break into a smile. I love how proud they are of the progress their country is making. I appreciate how, as older people, we are respected and actually looked out for. Most of all, I love their 5000 year old tradition of yoga and spirituality; the science of going beyond our limited minds to experience what every religion in the world has written about but doesn’t practice much— the peace that passes all understanding. And besides, India is never boring. There’s always a surprise around the corner and a personal challenge of patience and acceptance . We are staying in an ashram in a suburb of Delhi called Noida surrounded by call centers, offices, colleges, and many computer companies. The ashram is connected with the Yogoda Satsanga Society which is the Indian half of Self Realization Fellowship, based on the teachings of Paramahansa Yogananda. It feels like a peaceful garden island in the midst of a raucous world. I became a student of Yogananda in the late 1970’s when there were lots of “gurus” and consciousness raising organizations all over California charging huge sums to teach you to be peaceful and raise your consciousness. (This still exists.) But for me, Yogananda was love at first sight, and everything he taught has come true more than I dreamed possible. Our basic room has marble floors and platform beds. It was autumn and chilly in France. Here it is the end of monsoon season and HOT. The air conditioner is vintage 20th Century and sounds like a frenetic ping pong game or a Cuban rock band whose drummer is half asleep. AND David won’t dance with me. I feel ten pounds lighter here. Not so much in physical weight, but in the burden of my constantly changing mind. This is a very special place. This entry was posted in Paramahansa Yogananda, Yogoda Satsanga Society and tagged Delhi, India, Self Realization Fellowship. Bookmark the permalink. 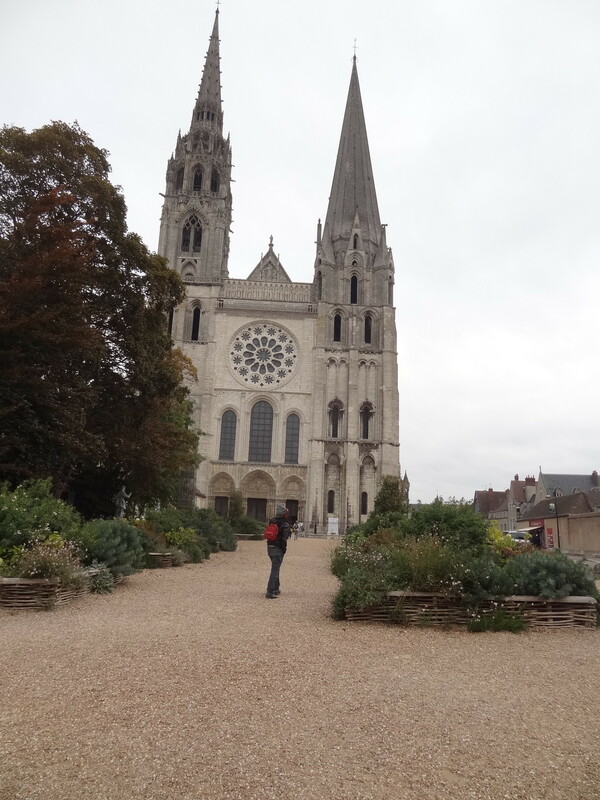 Chartres, a vision from medieval times. Yes, Patti, I love that you mention that you can see it from so far away. I too was struck by that. We drove the 40 miles from Paris and the cathedral kept getting bigger and bigger on the horizon. I imagined we were bumping along in a thirteenth century horse drawn-wagon. We see the structure for days as we get closer. We are inspired and excited about the jobs that await us as we help to build this testament in stone to human spirituality.